Vik Muniz is a Brazilian artist and photographer. Initially a sculptor, Muniz grew interested with the photographic representations of his work, eventually focusing completely on photography. Primarily working in series, Muniz incorporates the use of quotidian objects such as diamonds, sugar, thread and chocolate syrup. Our Fine Art Gallery has the finest quality Vik Muniz original artworks and cibachrome prints. We have a large inventory available off-site and we encourage you to make an appointment to see specific works you are looking to collect. We are happy to meet you at either our art gallery showroom or at your home or office for a private presentation. Contemporary Artist Vik Muniz was born to a working class family in Sao Paulo, Brazil in 1961. After relocating from Brazil to Chicago and later to New York, Vik Muniz began his art career as a sculptor in the late 1980s, but gradually became more interested in photographic reproductions of his sculptures, and eventually Vik Muniz turned his attention exclusively to photography. Vik Muniz’s early art grew out of a post-Fluxus aesthetic and often involved visual puns and jokes. Vik Muniz’s most famous sculpture from this period is “Clown Skull”, a human skull augmented with a clown-nose. During the 1990s Vik Muniz began to experiment more with photography and Muniz’s art started to develop its mature form. Vik Muniz created the series The Best of Life in 1990, where he drew pictures from memory of photographs that had been included in a coffee table book entitled “The Best of Life”. Vik Muniz’s drawings were subsequently photographed and shown as photographs, initiating Muniz’s adaptation of photography as his primary medium. Often working in a series, Vik Muniz began creating images out of readily recognizable non- art materials like wire (1994 Pictures of Wire) and string (1995 Pictures of Thread) and photographing them. Muniz’s process of making a drawing out of a nontraditional material and then photographing it has been central to Vik Muniz’s art and style ever since. In 1996 Vik Muniz received critical acclaim for his series Sugar Children marking the beginning of Vik Muniz’s commercial success as an artist. Vik Muniz went to a sugar plantation in St. Kitts to photograph children of the plantation laborers. Muniz then copied the snapshots of the children by layering different types of sugar on black paper and photographing the images. The New York Times reviewed the show and shortly after Vik Muniz was invited to participate in the 1997-1998 “New Photography” exhibition at the Museum of Modern Art in New York, as well as the “New Faces” exhibition at the Art Institute of Chicago. That same year Vik Muniz used Bosco Chocolate Syrup to create his photography series Pictures of Chocolate, in which Muniz rendered the image of Sigmund Freud and Leonard Da Vinci’s Last Supper out of the gooey substance. Continuing to work with fluid food textures, Vik Muniz used jelly and peanut butter in the creation of his art piece Double Mona Lisa, for Muniz’s 1998 series After Warhol, based on a screen prints by pop artist Andy Warhol. Vik Muniz often appropriates the images that serve as the basis for his photographs from famous artworks by other well known artists. 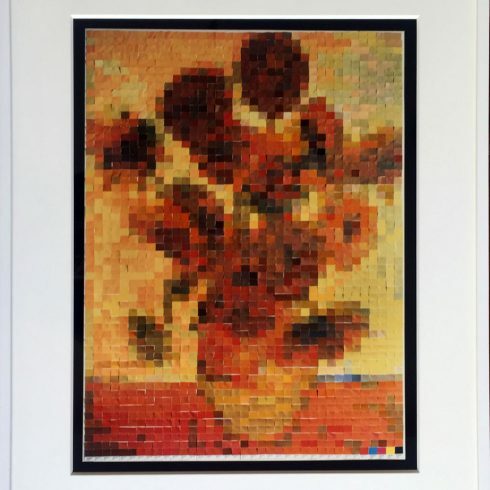 For example Vik Muniz has created renditions of: Van Gogh’s Sunflowers (Pictures of Color Series 2002), Klimt’s Death and Life (Pictures of Pigments 2006), and Caravaggio’s Narcissus (Pictures of Junk 2006). Vik Muniz has also reinterpreted a number of Monet’s paintings, including paintings of the cathedral at Rouen, which Muniz accomplished using small clumps of pigment sprinkled onto a flat surface. In 2010, the documentary film Waste Land, directed by Lucy Walker, featured Muniz’s work with a group of catadores —self-designated pickers of recyclable materials— on one of the world’s largest garbage dumps, Jardim Gramacho, on the outskirts of Rio de Janeiro, Brazil. The film was nominated for an Academy Award for Best Documentary Feature. Vik Muniz has used dirt, diamonds, caviar, dust and garbage to create bold, witty and often deceiving images drawn from the pages of photojournalism and art history, and Muniz has exhibited his photography and sculptures in major museums and galleries around the world. Artist Vik Muniz lives and works in New York City.